A US man and his seven children have been found dead at their home in Princess Anne, Maryland, apparently from carbon monoxide poisoning. The man's stepfather said Rodney Todd, 36, was trying to keep his family warm with a generator after the power was cut because of an unpaid bill. Lloyd Edwards said that Mr Todd, his two sons and five daughters died when "the carbon monoxide consumed them". Police said they were still investigating the cause of death. They said they have ruled out foul play, adding that a generator with no fuel was found in the home's kitchen. Officers also said that the electricity to the home was disabled. 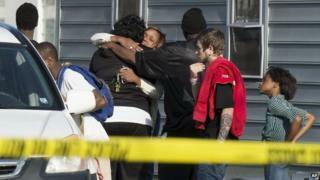 They identified the victims only as one adult and seven children, ranging in age from six years to the teens. Mr Edwards said that his stepson bought the generator after the power was shut off to their home. He and his wife, Bonnie, spoke outside the one-storey home in Princess Anne, which is located about 60 miles (95km) southeast of Annapolis, the Maryland state capital. A spokesman for the local power company would not say whether the power to the home was cut off, only that it was being investigated. Police were first alerted when Mr Todd's co-worker became concerned that he had not come to work in several days. "I don't know anyone his age who would have done what he did," Ms Edwards said. "I was so proud to say he took care of seven kids". Carbon monoxide is a colourless, odourless gas that is produced when carbon-based fuels are burned. Every year, more than 400 people in the United States are killed and over 4,000 are hospitalised when they unintentionally inhale too much carbon monoxide, according to statistics provided by US Centers for Disease Control and Prevention.